I have been trying to write a fitting headline to sum up the breath taking performance put in by Peel A last Monday as they defeated champions Onchan A in Isle of Man Bank league division one, and to me the score is the headline. It is remarkable in every way. On paper Peel were outclassed, outmatched and after losing 10-0 away at Marown last week looked set to face another mauling, but bowls isn’t played on paper and every member of the Govags first string ripped up the form book and stunned the champions. I am struggling to quantify just how impressive this score line is. In sport sometimes the opposition can play the game of their lives, their cup final and cause a massive upset but in bowls it isn’t like that. It is a team sport, but a match is made up of eight individual games so in essence to take four games off the champions and win on aggregate took eight cup finals. Captain Frank Watson led the way for his men with, quite frankly, a superb 21-13 win over two times Island Champion Kevin Quirk. I could try and run down the performance of Onchan and say they were under par or complacent after last week’s big victory over Douglas but this wouldn’t be fair on the boys from the Sunset City. On Monday night champions Onchan A were weighed, they were measured and they were found wanting. This and other recent results are building towards the most exciting season for over a decade and I am literally salivating to see how things unfold. All that is left to say to Peel is well done lads brilliant, absolutely brilliant. Marown A capitalised with another ruthless 10-0 win, this time away at Port St Mary A. The boys from the port are not as strong this term but even still for a team to leave there with maximum points is amazing. Whilst other teams are making all the headlines the men from the memorial playing fields are mercilessly going about the business of racking up points, and if the other title challengers are not careful they could find themselves with too big a bridge to build. Douglas A bounced back from last week’s defeat as they picked up and impressive 8-2 home victory over the much fancied South Ramsey. South are a much tougher proposition than last season, but so are the mercenaries from the Villa who were more than a match for the opposition on this occasion. This is the first time I have seen the new look South outfit and once they get their players firing on all cylinders though I am sure they are more than capable of causing a few upsets, and whilst I feel they are a little short of challenging for top honours this time around it may only be a matter of time. Castletown A kept momentum going, and the pressure on Marown, with a solid 9-1 home victory over North Ramsey A at the crofts. If I am honest I would expect a score line like this in favour of Town at home, but like all teams wanting to challenge Onchan & Marown it will be how they travel that makes all the difference. In the divisions final fixture Nobles Mixed picked up a much needed 6-4 home win over Ballaugh A. Both these teams could find themselves down the bottom of the table and who knows how vital these points will be at the end of the season? Both Castletown teams kept the pressure on at the top of division 2. This week the D performed better with a really good 6-4 victory away at Finch Hill B who are always tricky to beat on their own patch. The C had a battle on their hand at home to Port St Mary B and whilst they won 5-3 on games they lost on aggregate sharing the spoils 5-5. I fancy Port Erin to be near the top of the tree at the end of the season and a 7-3 win away at Ballaugh B will do their chances no harm at all. They are a quality outfit and if they continue to pick up points away and win their matches at home we be real contenders for silverware. Onchan B bounced back from last week’s defeat with 6-4 home victory over Peel B whilst Peel C won by the same score line as they entertained Douglas B. Port St Mary C produced some goo home form against Finch Hill to win 7-3 on the night. The Jim Senior 4 a side mixed team event was held at South Ramsey Bowling Club on Sunday and attracted what turned out to be a good entry of 13 teams. The format of the competition meant that matches consisted of each team fielding two singles players and a doubles pairing with the combined aggregate score determining the winners. There was a slight twist this year as every team that progressed was given the option of changing the batting order of their team for the next game. The team consisting of John Kennish, Elaine Moore, Fiona Kennish and Alan Moore came out on top after an extremely close and exciting final against Tony Dugdale, David Thomas, Nigel Thomas and Ben Dugdale. All three games started at the same time, with John Kennish coming off first with a 21-11 win against Tony Dugdale, putting his team 10 chalks in front. David Thomas reduced the deficit to 7 chalks after securing a 21-18 win against Elaine Moore. This left the doubles game on the green with the score at 19-13 to Ben Dugdale and Nigel Thomas. With Dugdale and Thomas lying the two chalks they needed to win their game and the final, Alan Moore played a great bowl deep in the corner to count one, only to see Dugdale play a superb running bowl to take it out. Under pressure with his last bowl, Moore produced an exact replica of his first to save game. An absolute “wonder wood” by Moore and bowl of the day without question. Fiona Kennish led out the next end trailing 14-19 with the final hanging in the balance. With Kennish and Moore needing to get to 15 to win the match they managed to score a double and therefore gain the chalk they and their team needed. Dugdale and Thomas closed the match out at the next end to win 21-16, which meant that the team from South Ramsey triumphed 55 – 53. In the semi finals the Kennish and Moore team beat Lyn Bolton, Trevor Quayle, Sid Bolton and Casey Bolton 56-51 in what was another close encounter and in the other semi final, the Dugdale and Thomas team eliminated Jenny Moore, James “Earl” Teare, Shelley Kennish and Lauren Groen by the score of 62-53. 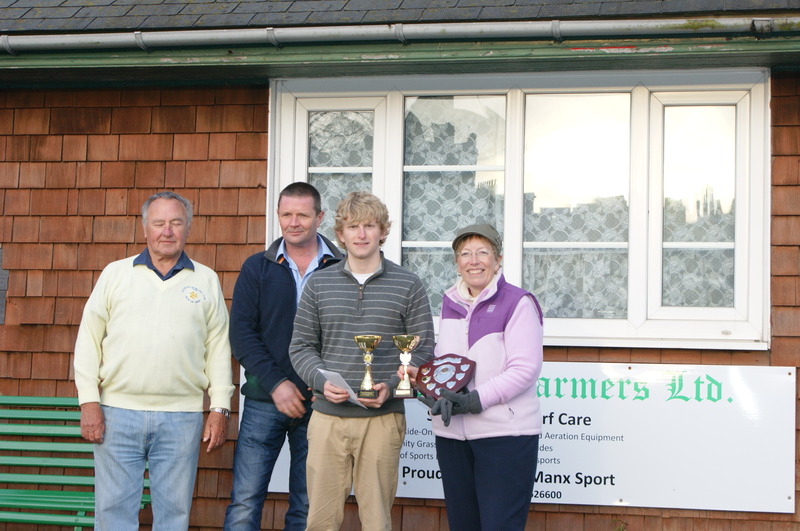 At the conclusion of the event the prizes were presented by Moira Anderson, President of South Ramsey Bowling Club. It was great to see such a good turnout of players for this event with 52 bowlers competing on the day, which included new bowlers and also some more experienced bowlers playing competition bowls for the first time. John Kennish made it two men’s singles open wins in as many weeks and he picked up the Henry Kissack trophy at Marown on Saturday beating Jordan Cain 21-15 in the final. The green was a joy to behold, although it was still tricky to find your length consistently, Arnie Withers and his helpers have done a fine job over the winter. If I am totally honest Kennish was not at his fine best but had just enough to grind out the victory on the day, and that is the sign of a great champion when they win despite struggling to find their form. Respective hard fought 21-17 victories over Gary Conwell & Michael Collister in the semi & quarter finals were enough to see him progress to the final and keep his 100% record in singles competitions this season alive. Cain was slightly below par in the final and fell at the last hurdle after some breathtaking performances in the previous rounds. In the semi finals he put out Onchan team mate David Bradford 21-15 after an exceptional start whilst in the quarters he kept his nerve after surrendering a 20-9 lead against home greener Phil Kelly to see the game out 21-20. If Cain keeps knocking on the door it will not be long before it opens. The other quarter finalists were Derek Clarke who put up a fine showing just losing out 21-20 to Bradford and Neil Withers who fell at the hands of Conwell. At the conclusion of the competition Phil Kelly from Marown presented the prizes. Summer arrived at Ballaugh on Saturday 27 April for the Pearl Kaighin ladies’ singles open. An entry of 31 produced some excellent bowling and after all the problems the club has had with the snow and rain the green was playing well if a little on the slow side. Perhaps it was the warm weather that helped create a friendly and pleasant atmosphere round the green and it was nice to see some “new” ladies taking part in their first open. Quarter-finals: Gill Dixon 21, Ann Gale11; Elaine Moore 21, Ann Hollingworth 16; Margaret Tasker 21, Heather Horsburgh 15; Philippa Fletcher 21, Chris Holland 16. Semi-finals: Gill Dixon 21, Elaine Moore 10; Philippa Fletcher 21, Margaret Tasker 13. This pitted Gill against Philippa, who was playing in her first final. A good number of spectators had remained to watch the final adding to the sense of occasion. The final was initially closely matched with the score being level at 11-11. Gill then won the next six ends to reach 20-11 but Philippa was not about to give up taking the next four ends to get to 16.Gill took the next end and victory 21-16. Jenny Maddrell thanked everyone who had stayed to the end. There was a new trophy presented by Bernard Kaighin who was unfortunately off island and unable to be present. In his absence the prizes were presented by Jane Teare. The Onchan A express got their title challenge firmly back on track at the top of Isle of Man Bank Men’s League Division One last Monday as they steamed to an 8-2 victory over Douglas A, derailing the visitor’s hopes of an upset in the process. In theory this sounds like a one sided affair however the reality on the night was very different and with only 7 points separating 8 games this is the closest 8-2 I have ever witnessed. If all of Douglas’ players had scored one more point or conceded one less they would have left with a 5-5 draw, as they would have turned around a 21-20 defeat and taken the two aggregate points. After such a valiant attempt away at the champion’s lair many would say that the men from the Villa deserved more. In sport, however, you don’t get what you deserve, you don’t get what you are given, you get what you take and the champions took their chances and in more than one game on the night grabbed victory from the jaws of defeat. This close encounter leaves me with two enduring proofs. Firstly, Douglas proved that their new line up is a match for anybody, home or away, and that their challenge for honours must be taken seriously. Secondly, and more poignantly, Onchan proved why they are perennial Champions and that if anybody wants to challenge them they will do so the hard way, with a fight on their hands. Marown A bounced back from last week’s defeat with a crushing 10-0 defeat of Peel A at the memorial playing fields. Peel had to postpone their first match due to snow on their green and made their return to the top tier the hard way, missing out on their first opportunity to put points on the board. What Marown’s maximum did show is that it is not necessarily how you perform against the top teams but how big you win against the lower ranked teams which might determine the fate of the championship, as they moved to the top of the table. I think the boys from Crosby will definitely be there again in the shake-up come September, and if they can continue to rack up the big wins who knows how close they can get to Onchan? All eyes were on a rejuvenated South Ramsey A who made their first appearance of the season and a 7-3 over Castletown B win has set them up nicely. They didn’t have things their own way however and Town pushed them all the way picking up another important 3 points. The focus will shift to the Villa Marina tonight (Monday) as the boys from South line up against Douglas with the result of this match possibly going someway to setting the tone for the rest of the season for these sides. In the other top flight match up North Ramsey A produced some good performances to notch up their first win of the season beating Nobles Mixed 7-3. The men from Mixed have had a tough start to the season and will be looking to get some momentum going tonight as they host Ballaugh A.
Castletown C & D kept up their respective charges for glory at the top of division 2 both picking up 7-3 victories to maintain momentum after a strong start to the season by both sides. No club has ever had 3 teams in the top division and whilst I expect the D to flounder a little as the season progresses I think the C can go all the way and etch their club into the history books. Douglas B notched up their first win of the season with a 7-3 victory over rivals Onchan whilst elsewhere Finch Hill B got the better of Peel C 7-3 in what could already be a battle for survival, even only two games into the season. Porst St Mary B overturned a 3-1 deficit to run out 7-3 winners at home to Ballaugh B whilst in the final game of the division much fancied Port Erin A won the local derby downing Port St Mary C 8-2. The highlight of the third division this week has to be Port Erin B’s 10-0 defeat of Ballaugh C. Douglas C and Onchan C made it two wins out of two both claiming good 7-3 victories up north at South Ramsey and North Ramsey respectively. I think all of the teams in this division are capable of surprise results meaning that at this early stage things are far too close to call. There was a new sponsor and a new look for the mixed doubles competition held at Douglas bowling club on Saturday 20th April. A total of 29 pairs put their names forward for the draw of the Isle of Man Farmers competition which in a new format was redrawn each round up until the final, meaning that nobody knew who they were due to play after the first round. Programmes and spot prizes were also a new feature on the day and despite one or two small teething problems the competition ran extremely smoothly and was a huge success, as was the first proper test for the new refurbished catering facilities. The field was a stellar cast and featured all of the main contenders you would expect to see fighting out for glory in a Mixed Doubles competition along with some new ad hoc pairings, which is always good to see. 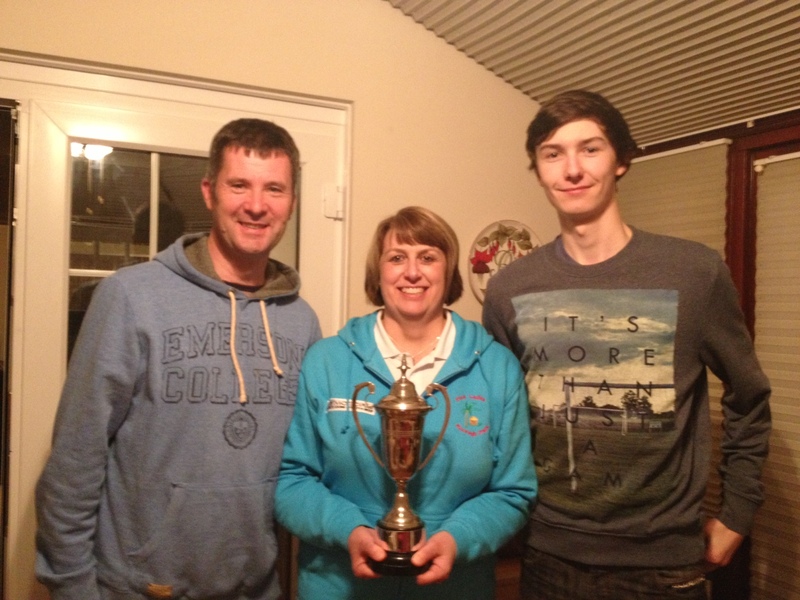 Inaugural winners Janet & Robert Monk played the tricky green exceptionally well and when ability seemed to elude other players who couldn’t get their heads around the green they managed to conquer the Villa and show mastery of their craft. They beat John Kennish & Jenny Moore 21-16 after an enthralling final. The eventual victors had their work cut out getting to the final after a hard fought contest with Rachel Quirk & Matthew Keggen in the semis. Kennish & Moore struggled to find their best in the final but got their thanks to a strong showing which saw them eliminate home greeners Stuart & Paula Garrett 21-12 at the same stage. Fallers at the quarter final stage were Brian & Sandy Lowe, Paula Firth & Jordan Cain, Ray & Ann Maddrell and Edward Trustham & Brenda Williams. After a truly successful event Mike Caley of Isle of Man Farmers presented the prizes. In this day and age of falling open numbers it is great to see a club trying new things and being prepared to think outside the box and step away from the norm. There was an entry of 14 ladies for the British Merit Qualifier played at Finch Hill on Sunday 21st April 2013. The weather stayed fair despite the threat of rain before the start and there were some hotly contested games in each round.The semi-finals were composed of four players from Mooragh Park, with Janet Monk coming through a tough game against Rachel Quirk 21-19, while Viv Grills did not find it a lot easier to see off Kellie Maddrell-Reeve 21-15. Thanks go to Finch Hill for the use of their facilities with a special mention to Anne and Maimie for providing the refreshments. sponsored Men’s singles competition to be played today. The bell rang for the start of Isle of Man Bank men’s division one with a gladiatorial like contest between rising contenders Douglas A and former champions Marown A at the Villa Marina last week. On paper the outcome looked too close to call with both protagonists evenly matched. Douglas did all the work in the early rounds and after some strong performances led 3-1 one at the half way point. The second half however was a different story with the seasoned war horses from Crosby throwing all they had at their adversaries to gain the upper hand and move into a slender 4-3 lead on games. This left the final bout on the green to decide the outcome of this epic encounter. Peoples champion Dave ‘Barney’ Kelly led Mike Cain 18-11, needing to ensure his opponent scored less than 17 to secure the win on aggregate for the home side. Cain showed the steely grit and determination of a battle hardened veteran closing the deficit to 15-18 and, with jack in hand, look like he would steal the points for the visitors. Kelly however had other ideas, showing that he has not only an iron will but an iron arm, delivering the knockout blow with a 21-15 win completing a hard fought 6-4 victory for Douglas. Reigning champions Onchan A started their title defence with what looked like a routine high scoring victory away at Castletown B. Nobody, however, told the homes side this and the boys from the crofts put in some gargantuan performances pushing the favourites all the way. Town played magnificently to pick up 4 wins on the night, drawing on games and narrowly losing out on the aggregate points to go down fighting 4-6. With Castletown B tipped by many for relegation, performances like this will go some way to proving their doubters wrong. Not many teams have picked up 4 wins against this stellar Onchan line-up so I cannot overstate how impressive this result is, and how vital these 4 points may be at the end of the season. Onchan will be a wounded animal and ready to prove why they are once again odds on favourites for the league as they entertain Douglas A at the park tonight (Monday). I think Douglas will be a good test for the Champions but on their home pitch you have to fancy them to pick up the win. Elsewhere in the division highly fancied Castletown A avoided a potential banana skin coming back from 3-0 down at Nobles Mixed to complete a strong 7-3 victory and get their 2013 campaign off the a strong start. Ports St Mary A weathered the close season storm and came out of the blocks strongly with a solid 7-3 home win over North Ramsey A.
Casteltown D are the surprise leaders at the top of Division 2 after an excellent 8-2 win over Peel C. Town as a club have strengthened in depth this year and this is evident across all of their teams as hot on their heels are Town C after a strong 7-3 home win over newly promoted Douglas B. My love affair with division 3 continued as I had the pleasure of watching newly formed teams Douglas C and Peel D slug it out at the Villa. There is something magical about this division for me and to see a mix of Peel’s old guard continuing to play into their twilight years and some of the new boys from Douglas was a joy to behold. The match had all the tension and drama of the previous night’s division 1 thriller and after some strong performances from both sides , noteably Mike Ashmole (Peel) & Clive McGreal (Douglas), was again finally poised with the aggregate points hanging in the balance. Ted Cain of Peel led 19-7 and needed to prevent debutant Thomas Keggen from getting to 9 to grab victory for his team, but Keggen dug deep and in only his first match managed to battle hard going down 21-9 ensuring his sides first ever league campaign started with a 6-4 win by the narrowest of margins winning 109-108 on points. North Ramsey B are another new team in this division and again started excellently picking up a 6-4 win on their trip to Nobles Park B. I wish all the new teams well and this week’s action in all divisions has only wet my appetite for a fantastic season ahead. The C.Tarleton Hodgson sponsored Jubliee Cup attracted a very good entry of 19 teams. The weather was dry but the cold and blustery wind made conditions tricky. The Green was in excellent condition as usual and the standard of bowling all afternoon was of the highest standard. The eventual winners were Kevin, Rosemary and Mathew Quirk, who beat the team of John and Fiona Kennish and Alan Moore 21-18 in a closely fought final coming back from 16-8 down. In the semi finals the Quirk team defeated the team of Margaret Tasker, Tricia Bull and Ron Maycox by score of 21-9 and the Kennish/Kennish/Moore team beat Bob Clark, Shelley Kennish and Nathan Cooil by the score of 21-19. Losing out in the quarter finals were Stuart and Paula Garrett and Paul Kelly, Ken Karran, Louis and Rita Callister, Val McFarlane and Ray and Ann Maddrell and Sam Palmer, Edwina Reid and Dorothey Mylchreest. Thanks to Rachel Quirk for the picture.